Example of a tongue-tie. Image courtesy of Wikimedia Commons. There is a small fold of tissue under the center of the tongue, known as a frenum, that connects the tongue to the bottom of the mouth and limits the tongue’s motion. There is also a frenum on the inside center of each lip that connects the lip to the dental arch and limits the lip’s motion. When a frenum is too thick or too strong, it limits the motion of the tongue or lip. An overly restrictive tongue frenum creates what is called a “tongue-tie”. When the frenum connecting either of the lips to the dental arch is too restrictive, this is called a “lip-tie”. A tongue- or lip-tie in a baby can inhibit the baby’s ability to properly breastfeed. As the child grows, this condition can inhibit their ability to eat solid food or enunciate words. If continued on into adulthood, it can lead to major oral health and eating problems, jaw joint difficulties and speech impediments. Dr. Levine has provided relief for thousands of infants, children and adults with tongue-ties—including babies as young as one day old. 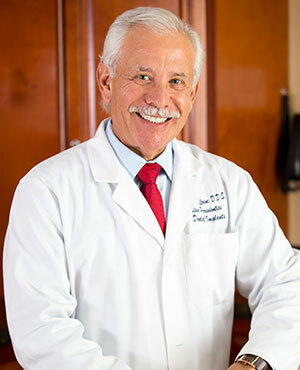 As a periodontist, Dr. Levine is a dental specialist in the treatment of the gum and soft tissues in the mouth. He is very skilled and experienced at releasing an overly restrictive frenum, removing tongue-ties and lip-ties and restoring normal function. He has provided relief for thousands of infants, children and adults—including babies as young as one day old. His use of a dental laser to release the tongue-tie makes the entire procedure minimally invasive and comfortable for patients of any age. Although tongue-ties are well-known to cause difficulties for babies, they can continue to cause problems as the child grows and all through adulthood. 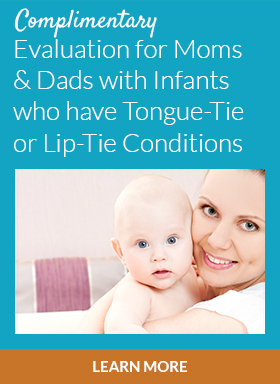 Below are the main difficulties that can come from a tongue-tie or lip-tie. For babies, the most common problem resulting from tongue-ties and lip-ties is the inability to properly breastfeed. The baby cannot fully latch on with restricted tongue and/or lip motion. This can cause the baby to take longer to feed, swallow air during feeding (leading to a gassy baby), receive less nourishment and experience other difficulties. For the mother, nursing becomes painful. By releasing the restricted frena in the mouth, full motion is restored and the baby can nurse correctly—comfortably and more enjoyably. For children and adults, a tongue-tie can inhibit complete chewing of food and make it difficult to swallow easily. This often leaves food residue in the mouth after eating and can lead to cavities and gum disease. Swallowing difficulties can also lead to tongue thrusting, which pushes the upper dental arch forward and leads to orthodontic problems. A tongue-tie can make it hard or impossible to speak properly. It often leads to lisping or an inability to pronounce certain letters correctly. A tongue-tie pushes the lower jaw backwards and can lead to jaw joint pain and tense muscles in the face and neck. This can cause misalignment between the face and neck and lead to a restricted airway during sleep, commonly resulting in snoring and sleep apnea. Adults wearing dentures may find that their lower denture fits poorly or loosens as a result of a frenum that is too thick or too strong. 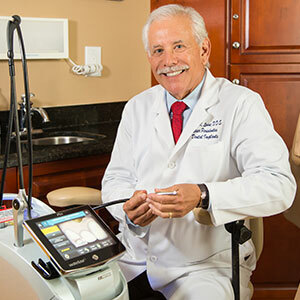 Dr. Levine uses a laser to gently release the tongue-tie. The laser causes little discomfort and promotes rapid healing. To correct an overly restrictive frenum, Dr. Levine performs a frenectomy—a quick and simple procedure that removes the excess frenum tissue that causes the tongue or lip-tie. He uses an advanced dental laser to gently remove the tissue. The laser beam makes a very tiny incision and seals the tissues as it goes, making it a minimally invasive alternative to a scalpel. Laser treatment causes little to no discomfort and healing is fast. It is completely safe for infants as young as one day old.